Pursuing an Online Career is a new trend in the modern era. Many individuals are slowly discovering the benefits of working from home. With the increasing number of people who are benefiting from their online work, there is no doubt that this is an ideal career to be taken into consideration. There is almost no limit on the things that we can do online nowadays. Knowing these things could help us take an overview of what we can expect and do online. Many people nowadays are taking advantage of the current trend and taking a big leap from the traditional way of making a living to having a career in the digital world. Before we jumped further into learning about specific online career and the benefits we could get from it, let us first take a look at the different activities people do online. People rely on the internet on almost everything they need. Knowing these things will give us a broader knowledge that will help us in determining what specific actions we could do in order to gain more from our online activities. This is the most common activity that an individual can do online. By nature, people seek to be entertained. After a day of working, we want to see something such as a movie, a clip of our favorite sports or just listen to our favorite music. Before the time of the internet, people would usually spend their time in front of the TV, or listening to music on a radio. From time to time, they would spend a day going to malls and watching the latest movie. The peak of the internet has brought major changes in the lives of the people in general. People started spending time on social media as a new form of entertainment. At first, they were enjoying the fact that they could connect with their long-lost friends and relatives. Eventually, social media became an avenue to showcase their achievements and personal milestones. 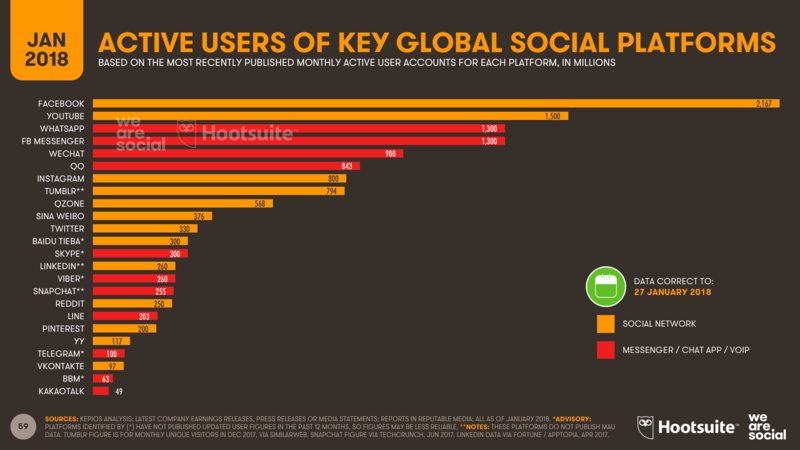 The data below from We Are Social shows the number of individuals who are using social platforms. Facebook remains on top of the list with more than 2.17 Billion at the start of 2018. Followed by YouTube with 1.5 Billion users. Because almost everyone has an access to the modern way of communicating, sharing information is no longer a problem. Through the use of the different medium of online communication, reaching out to a different group of people has never been this easy. Online marketers, bloggers, virtual assistants and other people working online can now send and receive communication easily. Being able to reach out to different people would mean growth in connection which is an important factor in building an online career. The presence of a large group of people online prompted the business industry to develop new ideas that will bring convenience to consumers. Online shopping was introduced. Because of the convenience, it can bring, people started to like this method of purchasing product and services. Business companies and individuals started to switch from a brick and mortar store to have an online e-commerce platform with their own strategies to generate more sales. An advertisement is one way of encouraging people to buy products and services is through advertising. The more engaging the advertisements, the higher the chance of getting sales. Online businesses are implementing their own promotional activities and strategies to improve their business. Because there is an increasing number of people that spent their time shopping online, there is a greater chance of generating more revenue from ads. On top of that, there is also a large market available for online sellers. People nowadays rely too much on the information they get online. Whether it may be school-related activities, business information, health or even for personal knowledge on doing things, they would try to find a solution online. Do you know what is the most searched information online? According to Mondovo.com the most asked question on google is “What is my IP?” Have you asked that question too? If yes, then you belong to the 3,350,000 monthly searches of that phrase. See the other most-asked question on Google from this page. Unlike the traditional way of learning new things, the internet can now provide us with a larger scope of things to learn. Many educational institutions are now adopting the online education program which is a good option for busy individuals who still want to learn more. Diplomas and certificates from these reputable institutions can now be accepted worldwide. There is no limit on the knowledge we can learn online as long as we are willing to devote time to learning. Free and paid options are available. Individuals who are too busy with their careers can no longer devote time to do their banking transactions. Nowadays, you no longer have to go to your bank and wait for several hours before you could be able to do your transactions. If you are not lucky enough, you might consume half day for your banking transaction. It’s a good thing that we already have online banking. You can check your balance, transfer fund to other accounts and transact other banking activities online. Bills payment option is now also available online. If you don’t have enough time to go to payment centers to pay your electricity, water, and other bills, you can easily pay your bills online. In the Philippines, we have several sites offering these transactions. Among the sites are Coins.ph and PayMaya. You no longer have to worry about getting lost if you just reached a certain place for the first time. In fact, you can familiarize yourself on the place before the actual visit. Apps like Google Street View can take you to the desired place and see the actual view without getting to the place. Online apps like Waze can help you in finding direction. How this can help you towards the improvement of your online career? There are many ways, actually. One way is you can write articles on how to use apps such as Google Street View in order to increase awareness with regards to a certain business. Through this, you can help businesses gain more clients by letting the people know of their existence. There are certain companies that specialize in providing services online. This can be service related to accounting, technical, legal and other forms of services which can be helpful in one way or another. If we have special skills, we can probably complete some tasks being requested by clients. Another thing we can do online is to safe keep our documents. The risk of losing our documents can be high if we will rely on keeping those in our own computers or drawers. These things can be stolen or can be damaged by unforeseen events. Sites like DropBox, Google Drive, and other cloud storage can help us store those important documents. Converting files from one form to another is no longer a problem. With different sites offering this service, we could assure of high-quality output every time. We can convert Word files into another file such as PDF within a short period. One example is the site SMALLPDF which helps convert files from one form to another at no cost and even without signing up. We can also merge, split, rotate, e-sign and unlock PDF in no time. Other sites offering file conversion are available online. The internet can bring us the latest happenings all over the world. With the use of the current technology, there is no limit on the information we can acquire. We can even watch live the happenings from all over the world. Newspapers which used to be read offline can now be found online. This interest opens opportunities to online writers and other online workers. Blogging is the current trend in online. Whether it is for personal or business purpose, the increase is notable as it is said to have 4 million blog posts being published online every day. How Knowing What Others Are Doing Online Can Help Our Online Career? As online workers or aspiring to be one, it is imperative that we know what other people are doing. The things they are doing online can be a source of information which may be helpful in improving our online career. With the above-mentioned activities, we can be a writer, blogger, researcher, website developer, seller, teacher or can do any other activities which can provide the needs and desire of other people. We can find people within our interest. We can be partners with some individuals or companies. Additionally, we can provide technical assistance to other individuals who might be needing one. Other people’s activities are as important as our own activities. The more we know what they are doing online, the greater chance for us to plan and take necessary actions for the improvement of our online career. Hi it’s me, I am also visiting this site on a regular basis, this web site is genuinely good and the visitors are actually sharing good thoughts. Thank you for dropping by. It’s good to know that you find this place helpful.